Ukraine was never part of your plan. This trip was supposed to be all about Poland. During your first trip to the Eastern European country, you planned to visit Warsaw and Łódź, Wrocław and Kraków. Then you added Lublin, the largest city in southeast Poland, to your itinerary. From there, it was only a matter of time until you crossed the border. You don’t remember where you first saw photographs of Ukraine’s Tunnel of Love. They immediately captured your attention, though. The walkway was surrounded by and overflowing with greenery. It looked like it was part of a fairy tale or at least a romantic comedy. You didn’t even notice the railroad tracks at first. You were too busy staring down the seemingly endless tunnel. 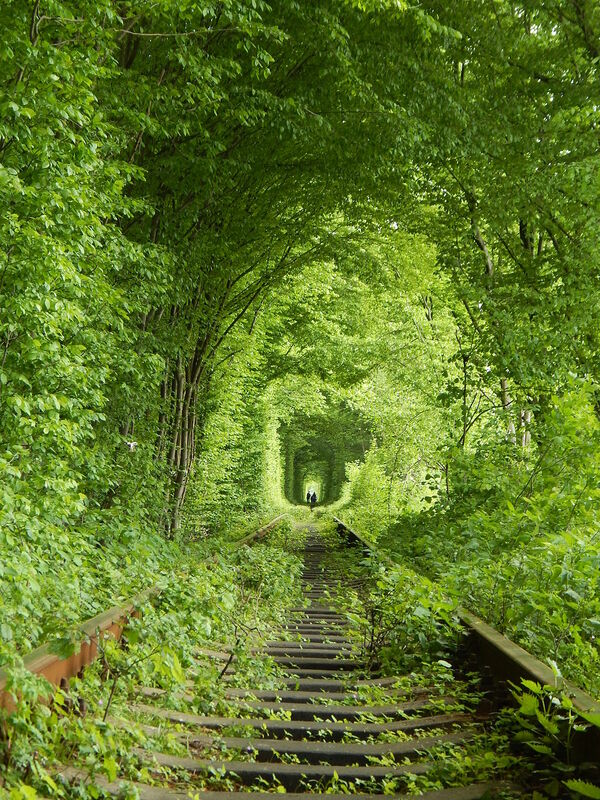 The Tunnel of Love is considered one of the most romantic places in Ukraine, if not all of Europe. It surrounds a three-mile, narrow-gauge track that leads to a plywood factory in Klevan. The small town, along the Stubla River, is home to the ruins of a castle, a handful of churches, and a sad Jewish history. When local authorities stopped cutting down trees along the railroad, Klevan became famous for a much happier reason. Now couples flock to the Tunnel of Love. They take photos of the tunnel, each other, and the slow-moving trains as they approach. They makes wishes, which legend promises will come true if their love is sincere. Plus they escape into a dream world, for at least a little while. Soon, you will, too.